During his lifetime, Irish Blues-rock guitarist Rory Gallagher was inspired by crime-noir stories, and this can be seen in the lyrics to some of his songs. Now a new release is tying his music together with the crime-noir genre in a new way - it's part music and part crime-noir novella. It comes in a hardback book style case with a nicely illustrated cover. Inside you have three CD's and some postcards contianed within sleeves at the front and rear of the book. Then you have the book section which is a short story from the bestselling author Ian Rankin. The book itself isn't simply presented as text, but has pages of illustrations in the graphic novel style between the pages of text. The whole thing looks great, but obviously content is key. Starting with the story, Ian Rankin has done a great job of this crime-noir short story which has been written specially for this project and which is based around some of Rory Gallagher's songs, so the inclusion of a loanshark for instance maps nicely to the song "Loanshark blues". The story is a good read, and fans of crime-noir will enjoy it, as will fans of films such as "Sin City" which shares the same dark gritty feel. The music is off course superb, but with Rory Gallagher's albums already available then this is essentially a themed compilation album. Normally then fans wouldn't have much interest as there's little point buying compilations if you own the original albums, but the inclusion of the book element really does change that - it's a great way to showcase Rory Gallagher how much of his work was inspired by the characters and themes found in the crime-noir genre detective novels of authors such as Raymond Chandler and Dashiell Hammett. 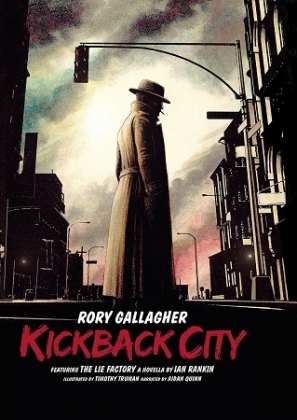 In some ways things have come full circle - we have a crime-noir story inspired by the work of Rory Gallagher who was himself inspired by crime-noir stories. This is a great release that stands well above the average compilation release, and is something that will appeal to a lot of his fans Highly recommended.